Rather than being linear, the historical progression of topics in physics sometimes takes a tortuous route. There are two Annual Reviews of Condensed Matter Physics articles, one by P. Nozieres and one by M. Dresselhaus, that describe how widespread interest on certain subjects in the study of condensed matter were affected by timing. But neither I nor any of these famous people ever suspected what was hiding behind that linear dispersion. Fifty years later, graphene became a frontier of physics with far-reaching quantum effects. Dresselhaus also mentions that carbon nanotubes were observed in 1952 in Russia followed by another reported discovery in the 1970s by M. Endo. These reports occurred well before its rediscovery in 1991 by Iijima that sparked a wealth of studies. The controversy over the discovery of nanotubes actually seems to date back even further, perhaps even to 1889 (pdf)! In the field of topological insulators, again there seems to have been an oversight from the greater condensed matter physics community. As early as 1985, in the Soviet journal JETP, B.A. Volhov and O.A. Pankratov discussed the possibility of Dirac electrons at the surface between a normal band-gap semiconductor and an “inverted” band-gap semiconductor (pdf). Startlingly, the authors suggest CdHgTe and PbSnSe as materials in which to investigate the possibility. A HgTe/(Hg,Cd)Te quantum well hosted the first definitive observation of the quantum spin hall effect, while the Pb Sn Se system was later found to be a topological crystalline insulator. When a problem is not ripe you simply do not see it. I don’t know how one quantifies “ripeness”, but he seems to be suggesting that the perceived importance of scientific works are correlated in some way to the scientific zeitgeist. In this vein, it is amusing to think about what would have happened had one discovered, say, topological insulators in Newton’s time. In all likelihood, no one would have paid the slightest attention. Condensed matter physics has, in the past ten years or so, made a left turn towards studying topological properties of materials. Following the discovery of the Quantum Hall Effect (QHE) in 1980, it took about 25 years to experimentally discover that similar phenomenology could occur in bulk samples in the absence of a magnetic field in topological insulators. In the current issue of Nature Physics, there are three papers demonstrating the existence of a Weyl semimetal in TaAs and NbAs. These states of matter bear a striking similarity to quantum mechanical effects such as the Aharonov-Bohm effect and the Dirac monopole problem. So what do all of these things have in common? Well, I vaguely addressed this issue in a previous post concerning Berry phases, but I want to elaborate a little more here. First it should be understood that all of these problems take place on some sort of manifold. For instance, the Aharonov-Bohm effect takes place in a plane, the Dirac monopole problem on a 3D sphere and the problems in solid-state physics largely on a torus due to periodic boundary conditions. Now, what makes all of these problems exhibit a robust topological quantization of some sort is that the Berry connection in these problems cannot adequately be described by a single function over the entire manifold. If one were to attempt to write down a function for the Berry connection, there would necessarily exist a singularity somewhere on the manifold. But because the Berry connection is not an observable, one can just write down two (or more) different functions on different parts (or “neighborhoods”) of the manifold. The price one has to pay is that one has to “patch” the functions together at the boundary of the neighborhoods. Therefore, the existence of the topological quantization in most of the problems described above arise because of a singularity in the Berry connection somewhere on the manifold that cannot be gotten rid of with a gauge transformation. For instance, for the Aharonov-Bohm effect, the outside of the solenoid and the inside of the solenoid must be described by different functions, or else the “outside function” would be singular at the center of the solenoid. Qualitatively, one can think of the manifold as a plane with a hole punched in the middle of it. In the case of the Dirac monopole, the magnetic monopole itself is the position of the singularity and there is a hole punched in 3-dimensional space. There is an excellent discussion on both these problems in Sakurai’s quantum mechanics textbook. I particularly like the approach he takes to the Dirac monopole problem, which he adapted from Wu and Yang’s elegant solution. The explanation of the QHE using similar ideas was developed in this great (but unfortunately quite mathematical) paper by Kohmoto (pdf!). I realize that this post only sketches the main point (with perhaps too much haste), but I hope that it will be illuminating to some. Update: I have written a guest post for Brian Skinner’s blog Gravity and Levity where I discuss the topics here in a little more detail. You can read the post here if you’re interested. Thouless, Kohmoto, Nightingale and den Nijs in 1982 wrote a landmark paper relating the Hall conductivity to the Chern number (also now known as the TKNN invariant). It is well-known that the Quantized Hall Effect (QHE) is an extremely robust phenomenon of topological origin (pdf!). One can think of the Hall conductivity as measuring the total Chern number of the occupied Landau levels. What baffles me about the TKNN result is that despite the robustness and topological character of the QHE, the authors are able to use linear response theory. This must mean that second and higher order responses must somehow be exponentially suppressed and that the response is perfectly linear. I have not come across a proof of this in the literature, though it may very well be an (boneheaded!) oversight on my part. This line of questioning also applies to the Quantum Spin Hall Effect and the Quantum Anomalous Hall Effect. While phenomena that are now considered prototypical Berry phase effects were understood before the Berry paper, it was Berry who unified many concepts under a general framework. For instance, the Aharonov-Bohm effect, the Dirac monopole problem and the Integer Quantum Hall Effect were all understood separately, but the Berry phase concept presented a huge leap forward in consolidating these seemingly disparate phenomena. It should be mentioned that the three cases mentioned above are all instances where the Berry phase is topological and results in a robust quantization through a topological invariant (known as the Chern number). However, the Berry phase does not have to be topological in nature and can have “geometrical” consequences. Many of these “geometrical” consequences are discussed in a great review article by Xiao, Chang and Niu. One particular “geometrical” consequence stands out: the semiclassical equations of motion for electrons in a solid, as detailed in textbooks such as Ashcroft and Mermin, are incomplete! The application of an electric field in crystals with either broken time-reversal symmetry or broken inversion symmetry may, under certain circumstances, exhibit a transverse velocity associated with a non-zero Berry curvature (i.e. an application of an electric field in the x-direction will result in electrons travelling in the y-direction!). This experimental paper by NP Ong’s group demonstrates this effect (pdf! ), and this paper by Karplus and Luttinger (paywall!) theoretically explains the transverse velocity in ferromagnets, again before Berry’s seminal paper. I’ll also mention briefly that the seemingly mundane phenomenon of electrical polarization in solids is another case that cannot be explained without Berry-esque concepts, but I’ll leave that topic for another day. It truly is stunning how many effects can be accounted for under the umbrella of Berry/Zak ideas. I’ll even restrain myself from mentioning topological insulators and Chern insulators (paywall) / the quantum anomalous hall effect (paywall). 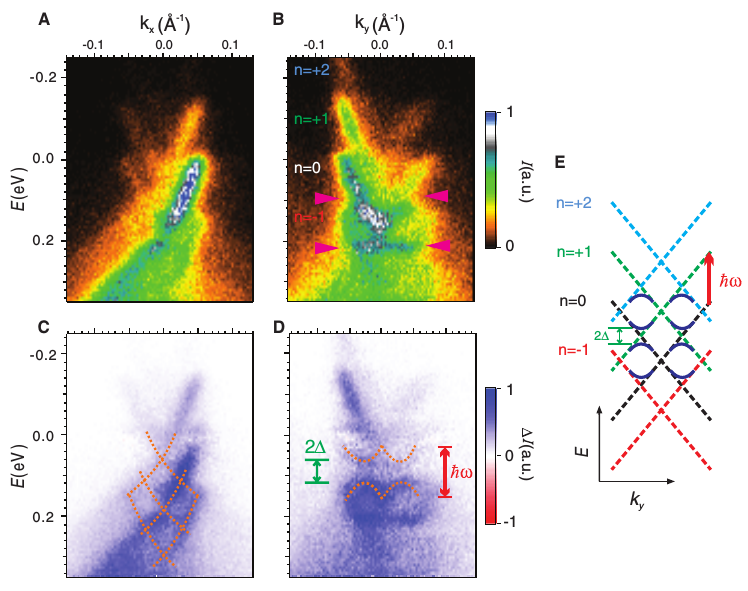 In a very beautiful 2013 paper by the Gedik group (click here for arXiv link) at MIT, they observed Floquet states on the surface of topological insulator Bi Se using angle-resolved photoemission. One can see the repetition in (in A and B in the figure) as determined by the frequency of the incoming laser pulse. Furthermore, one can see the bands interacting with each other and causing gaps to open up as pictured in the schematic on the right and in the data in C and D in the figure. A very simple idea, a very elegant experiment. How do we define states of matter? Historically, many people seemed to lean towards defining a phase of matter by its (broken) symmetries. For instance, a ferromagnet has broken rotational symmetry and time-reversal symmetry, a solid has broken translational and rotational symmetry, etc. In light of the discoveries of the Quantum Hall Effect and topological insulators, it seems like this symmetry classification does not encompass all states of matter. Put another way, to verify that one has discovered a superconductor, these three criteria must be satisfied. Let us take another example: a simple metal. The criterion that must be satisfied for this case is the existence of a Fermi surface. This can be measured by quantum oscillation measurements, angle-resolved photoemission, or a few other probes. While these three examples were chosen because they were simple, I have remaining doubts. Are these observations necessary and sufficient to define these states of matter? Are there cases where one can better define a state of matter theoretically? For instance, a theorist may define a 2D topological insulator by the existence of a non-trivial topological number, which seems like a perfectly valid criterion to me. This topological number cannot be experimentally observed in a very direct way (to my knowledge) and has to be inferred from the edge states, band structure, etc. [A charge density wave is a] Peierls-like instabilit[y] that occur[s] due to a divergency in the real part of the electronic susceptibility, so that the electronic subsystem would be unstable per se, even if the ions were clamped at their high symmetry positions. This definition bothers me in particular because it defines a charge density wave by its cause (i.e. Peierls-like instability due to a divergence in the real part of the electronic susceptibility). The main qualm I have is that one should not define a state of matter by its origin or cause. This is like trying define a superconductor by the mechanism that causes its existence (i.e. phonon-mediated electron-electron interaction for superconductors, which would exclude unconventional superconductors from its definition). This is obviously problematic. Therefore, shouldn’t one define a charge density wave by its experimentally measured properties? So I come back to the original question: how does one define a state of matter?